Ginny has been a credentialed technician since graduating from Fairmont State College in Fairmont, WV with an AAS in Veterinary technology and passing the national board exam in 2001. She later received her BS in Allied Health Administration from FSC in 2003. Since that time, she has spent the majority of her career in academia and specialty medicine; she received her VTS in Anesthesia and Analgesia in 2012 and a Masters degree in Strategic Leadership from East Tennessee State University in 2013. She is the president of the Tennessee Veterinary Technicians Association and is currently working hard along with many others on trying to get TN to be one of the first states to pass the “Registered Veterinary Nurse” legislation. Anna has been working in both academia and private practice since graduating with her AAS from Bel-Rea Institute in 2003 and then further completing her BS from Purdue University in 2006. While in academia she has focused a majority of her interests on canine physical therapy, wound healing and stem cell therapy. Anna currently spends her time working as an oncology technician at Newtown Veterinary Specialists in Newtown, Connecticut. In her down time she enjoys spending time on her family farm with her three children, husband, five dogs, one cat, and a variety of farm animals. Dogs and cats with upper airway conditions are often seen in the clinic when their condition is acute. Many of these animals are in critical condition as the result of a chronic disease that has progressed to an acute stage. Chronic conditions that typically develop due to breed predispositions or infectious agents include laryngeal paralysis, collapsing trachea, and brachycephalic airway syndrome in dogs and inflammatory polyps in cats. This article will provide a synopsis of each condition and information about how to appropriately manage these patients to provide comfort and stabilization. Upper respiratory conditions in companion animals are complex and require appropriate understanding in order to provide optimal prognosis. In patients with conditions that cause airway impairment, hypoventilation and hypoxemia are often noted. The veterinary team needs to respond to these patients urgently to help prevent catastrophic events, such as severe acid-base imbalances or respiratory arrest.1 When the airway becomes partially or completely obstructed, which often occurs in patients with the conditions described in this article, the veterinary emergency team must work quickly and efficiently to ensure patient survival. Eliminating stress in a patient that is having respiratory difficulty is almost as important as establishing a patent airway since stress is going to make the patient work even harder to move air. Sedation is one of the best methods for reducing stress in these animals. 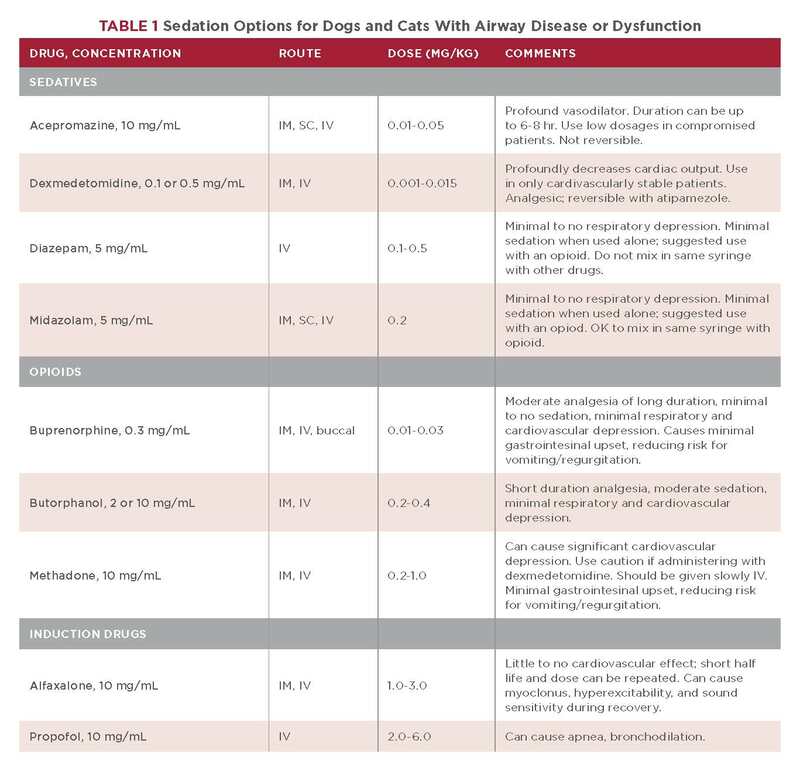 Administration of one or a combination of medications (TABLE 1) can decrease patient anxiety and enable the veterinary personnel to more successfully assess the patient and its airway. 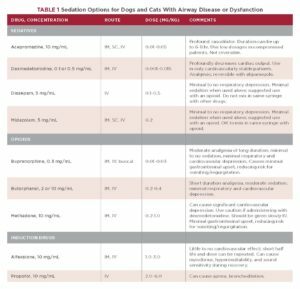 Combining a sedative with an opioid (neurolept anesthesia) will increase potency and duration of sedation, allowing more time for patient stabilization. Providing supplemental oxygen and obtaining vascular access for administration of further sedation or to induce anesthesia are also key components during emergency stabilization. The use of anti-inflammatory medications in these patients may also be indicated since swelling may occur in their upper airway. It is imperative to have endotracheal tubes readily available as many of these patients may require intubation followed by general anesthesia for stabilization. Access to a variety of endotracheal tube sizes will ensure adequate preparation for intubation if airway swelling is present. Moreover, alternative methods for oxygen delivery should be available if airway patency cannot be achieved via endotracheal intubation; examples include use of polypropylene catheters, which can be used in lieu of endotracheal tubes. One of the most common disease processes involving the larynx is laryngeal paralysis; prevalence is higher in dogs than in cats.2 To interpret diseases of the larynx, it is vital to understand how the larynx functions. The larynx is a collection of cartilaginous structures that sit in the back of the throat over the entrance of the trachea. Muscles attach to the larynx, allowing the arytenoid cartilage to open when breathing and close when eating or drinking. The larynx is responsible not only for protecting the trachea but also for voice production and control of airflow during respiration.3 Laryngeal disease in dogs and cats can result in life-threatening airway obstruction, depending on the severity and etiology of the disease. There are many causes of laryngeal paralysis. In most cases, the cause remains undetermined, and these cases are traditionally classified as disease associated with an endocrinopathy, infection, or immune-mediated polyneuropathy.3 Patients are most commonly older, overweight, or both; predisposed breeds include Labrador retrievers, golden retrievers, and Saint Bernards. Dogs with laryngeal paralysis often exhibit significant stridor, excessive panting, respiratory distress, exercise intolerance, and dyspnea and have a history of a hoarse bark.2 A complete neurologic and upper airway examination should be performed for patients suspected of having laryngeal paralysis. A definitive diagnosis of laryngeal paralysis requires a complete laryngeal examination and can be accomplished by visualization of the larynx under brief sedation. The most current sedation protocol recommends propofol induction at 4 to 8 mg/kg IV, administered slowly and, if required to stimulate respiration, administration of doxapram HCl at 1 to 2 mg/kg IV.2 If significant laryngeal swelling is present, a dose of dexamethasone at 0.1 to 0.2 mg/kg can be administered.3 If surgery is to be performed, an analgesic such as buprenorphine should be administered. Care should be taken to select a pain management plan that will limit regurgitation or vomiting. Conservative medical management is ideal if significant respiratory compromise is not present. The goal of medical management is to improve the patient’s quality of life through exercise restriction, weight loss, and owner education. Unfortunately, medical treatment is often insufficient for long-term management and surgical intervention becomes necessary. Surgical intervention is offered as a salvage procedure when conservative therapy has proven unsuccessful and the patient’s well-being is threatened. Numerous surgical procedures are described; however, unilateral arytenoid lateralization (or laryngeal tie back) is the most commonly performed. Suture is placed from a lateral cervical approach to help lateralize the arytenoid cartilage, increasing the area of the opening of the rima glottidis. Given this change in laryngeal anatomy and newly unprotected airway, aspiration is the most concerning postoperative complication and can ultimately be fatal. Other complications include voice change, persistent coughing and gagging, repair failure, and seroma. Because of this anatomic alteration and associated complications, unilateral arytenoid lateralization is preferred over a bilateral technique, which would increase the area of unprotected airway even more. 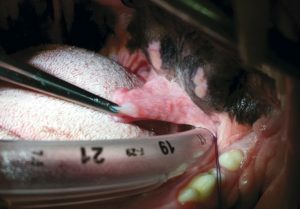 Patients who undergo surgical repair for laryngeal paralysis require specific postoperative considerations to help prevent further laryngeal swelling and conditions such as aspiration pneumonia and hyperthermia. Collapsing trachea is a progressive and degenerative disease in which the tracheal rings weaken over time and flatten during inspiration and expiration. Tracheal collapse is most commonly seen in toy and small breed patients of middle to older age. There are numerous clinical signs that often make it clear that a patient has collapsing trachea. The clinical signs will depend on the severity of the case, but common signs include the classic “goose-honking” cough; a cough elicitable by tracheal palpation; and varying levels of dyspnea, cyanosis, and exercise intolerance.4 Most commonly, dogs have a congenital predisposition to collapsing trachea and a secondary factor triggers the clinical syndrome or progression of the disease.3 Secondary factors that can trigger collapsing trachea include obesity, bacterial infections, and chronic airway disease. Medical management of patients with collapsing trachea is reported to be moderately successful despite the degenerative nature of the disease. Studies have shown that 71% to 93% of dogs respond well to medical management for longer than a year.5 The primary goal of conservative management is to limit the clinical signs. This goal can be attained via weight loss, administration of antitussive and bronchodilator drugs, and elimination of environmental factors such as airborne irritants. FIGURE 1. Surgically placed tracheal rings. Note that rings are sutured on the outside of the trachea to help maintain an opening. Surgical intervention should be considered when medical therapy is no longer effective. The goal of surgery is to correct the anatomic defects of the tracheal rings (FIGURE 1). Although no surgical procedure will cure the disease, tracheal stenting or placement of synthetic tracheal rings improves the tracheal anatomy to allow for better airflow.4 However, surgery is not a cure for this progressive disease process. The prognosis following surgical intervention varies according to the severity of the disease. FIGURE 2. Example of a dog with unilateral stenotic nares. (A) normal opening, (B) stenotic opening. 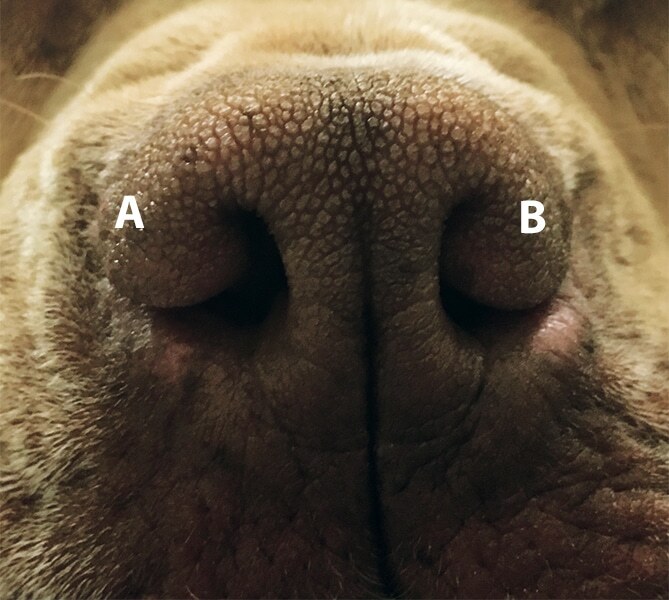 Stenotic nares are narrowed nostrils, which can lead to a pinched appearance (FIGURE 2). They are considered to be one of the most common traits in animals with brachycephalic airway syndrome; prevalence rate among these animals is 17% to 77%. This narrowing increases airflow resistance up to 16 times over that of an animal with normal nares.6 Because of the airflow resistance, it is thought that elongated soft palate may be a secondary rather than primary condition. The chronic airflow resistance and increased negative inspiratory pressure leads the upper airway to be sucked in, leading to other conditions such as everted laryngeal saccules and tonsils; epiglottal and soft palate swelling; and even tracheal, laryngeal, and bronchial collapse.6,7 Elongated soft palate is common and varies in severity; it is seen in approximately 62% to 100% of animals with brachycephalic airway syndrome. The soft palate is considered to be elongated when it extends past the tip of the epiglottis.6 The soft palate often extends far beyond the epiglottis in these animals, causing a partial or even a complete airway obstruction, which can lead to an emergent crisis (FIGURE 3). 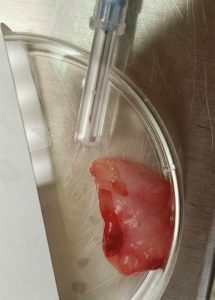 Hypoplastic trachea, or a narrowed or smaller than expected trachea, are less common in dogs with brachycephalic airway syndrome; occurrence is approximately 13%. English bulldogs seem to be overrepresented.6 It is common to see animals with brachycephalic airway syndrome in an emergency setting due to complications from the above-mentioned clinical signs. When recovering from anesthesia, patients with brachycephalic airway syndrome often take longer to recover, need to remain intubated longer, and should not be extubated until fully awake and able to protect and control their airway. FIGURE 3. Elongated soft palate on a patient being prepared for staphylectomy. A diagnosis of brachycephalic airway syndrome requires examination of the airway. Diagnosis is confirmed by transoral laryngeal examination under heavy sedation or a light plane of anesthesia.8 If the patient has any of the above-mentioned traits pertaining to the airway, they are considered to have brachycephalic airway syndrome. Eversion of the laryngeal saccules is considered to be the first stage of laryngeal collapse (stage 1), and collapse of the arytenoid cartilage is the final stage of collapse (stage 3).8 Treatment of brachycephalic airway syndrome primarily involves surgical fixation; however, medical management similar to that described for animals with laryngeal paralysis may be effective. Depending on the severity of clinical signs and which anatomic abnormality is present, any number of surgical options may be performed: staphylectomy (soft palate resection); rhinoplasty (opening of stenotic nares); arytenoid lateralization (for collapse of the arytenoids); and, for severe cases, permanent tracheostomy. It is commonly recommended that staphylectomy and rhinoplasty, if warranted, be performed on young animals.6,7 Early intervention can provide a higher quality of life for these patients and help prevent secondary conditions later in life. FIGURE 4. Nasopharyngeal polyp that was removed via traction and tooth-grabbing forceps. Complications from feline inflammatory polyps are uncommon in the emergency setting. However, the sedation that is commonly required for appropriate diagnosis can lead to a life-threatening situation if the clinical team is not prepared. After a cat with a suspected polyp is sedated, an oral polyp can relax and descend into the airway, partially or completely occluding the trachea, leading to respiratory and cardiac arrest if not treated immediately. It is suggested to have supplies for intubation and a method to deliver oxygen readily available for any cat with a suspected inflammatory polyp—especially nasopharyngeal in origin—prior to inducing sedation. Having intravenous access prior to sedation is also recommended (FIGURE 4). Patients with the upper airway conditions discussed in this article can have a good quality of life if the underlying condition is diagnosed and treated appropriately in the early stages of the disease. For examining these patients, sedation is often warranted and necessary for their stabilization and comfort. The use of certain opioids is controversial due to the possibility of causing further respiratory depression as well as vomiting, nausea, and regurgitation. The opioids listed in the chart are considered to be safer and less likely to cause these undesirable side effects. Prior to any sedation, especially in a patient that has respiratory pathology, the veterinary team needs to be prepared to intubate and induce anesthesia as needed. After all, when one is prepared for the worst, the worst usually doesn’t happen! Brunson D, Johnson R. Respiratory disease. In: Snyder L, Johnson R, eds. Canine and Feline Anesthesia and Co-Existing Disease. Ames: John Wiley and Sons Inc.; 2015:69-83. Monnet E, Tobias KM. Larynx. In: Tobias KM, Johnston SA, eds. Veterinary Surgery Small Animal. Vol. 2. St. Louis: Elsevier Saunders; 2012:1718-1733. MacPhail C. Laryngeal disease in dogs and cats. Veterinary Clinics of North America: Small Animal Practice. Vol 44. St. Louis: Elsevier Saunders; January 2014:19-31. Monnet E. Tobias KM. Trachea and bronchi. In: Tobias KM, Johnston SA, eds. Veterinary Surgery Small Animal. Vol. 2. St. Louis: Elsevier Saunders; 2012:1734-1751. Tappin SW. Canine tracheal collapse. Journal of Small Animal Practice 2016;57:9-17. Meola SD. Brachycephalic airway syndrome. Topics in Companion Animal Medicine 2013;28(3):91-96. Tobias K. Elongated soft palate. In: Tobias K, ed. Manual of Small Animal Soft Tissue Surgery. Ames: John Wiley and Sons; 2009:407-415. Schlicksup M. Upper airway disease: brachycephalic airway syndrome. Small Animal Surgical Emergencies. Hoboken: WileyBlackwell; 2015:270-78. Greci V, Mortellaro C. Management of otic and nasopharyngeal, and nasal polyps in cats and dogs. Veterinary Clinics of North America: Small Animal Practice 2016;46(4):643-61. Klose T, MacPhail C, Schultheiss, P, et al. Prevalence of select infectious agents in inflammatory aural and nasopharyngeal polyps from client-owned cats. Journal of Feline Medicine and Surgery 2010;12(10):769-774.